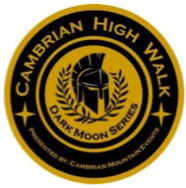 The “Cambrian High Walk Summer Series” returns this summer with a twist! 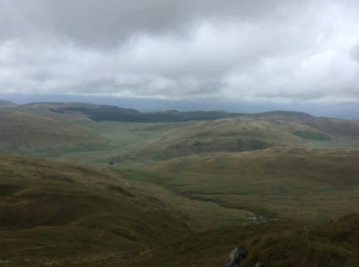 The annual circa 25k gruelling test over the Cambrian Mountains is hosted in the height of summer during the day to give you the opportunity to take it on with the comfort of daylight and hopefully fair weather being in your favour; but still requires to be completed in under 5 hours to earn the coveted High Walk summer series patch. for those who successfully complete the challenge in daylight and dare to push their boundaries to another level, the more intense “ Recoil Dark Moon” is hosted from dusk into the night across another testing and challenging circa 18k course on the same day, which must be completed in under 4 hours to earn the coveted Recoil patch. This “special edition” event will not be hosted annually, and is an opportunity for those who got what it takes to test their metal. It’s not for the faint hearted! The “High Walk - Dark Moon” is also open to those who only wish to take on and experience this High Walk dusk into the dark challenge, but they must have experience in partaking in similar night time challenge events. Those who successfully complete this event will receive the coveted “High Walk Dark Moon” patch. Again, this “Dark Moon” event may not be hosted annually, and is an opportunity for those who got what it takes to test themselves on this challenging course in the dark. 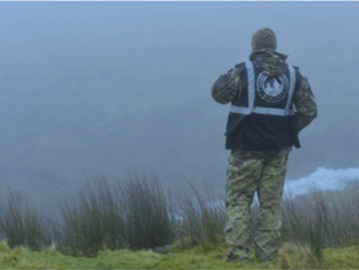 Most of you who find this challenge of interest would have heard of, know of, or have partaken in the infamous Military Selection Course over Pen-y-Fan in the Central Brecon Beacons. 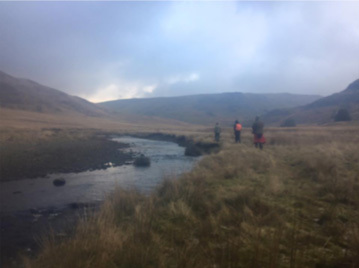 The Cambrian High Walk is of the same calibre, if not slightly more strenuous, which will test the participants stamina and will-power against the clock over the challenging and wild terrain on the Cambrian Mountains. Steep ascents, precarious descents, wild river crossings and un-pathed boggy terrain littered with babies-heads form a majority of these testing and gruelling courses. Marshals and Directing Staff will monitor progress of the participants throughout the course. There will be intermittent Check Points and Rendezvous Stations along the route where participants must check-in. Self-supported loadbearing: the participants must carry a weighted Bergen/Rucksack of 16kgs (35lb) that includes essential safety and mountain equipment, but excludes food and water for consumption; and navigate their own way over the course. Self-supported clean fatigue: the participants are not required to carry the weight in the load-bearing category, but must still carry suitable mountain rucksack containing essential safety and mountain equipment plus the required food and water; and navigate their own way over the full course. The typical Cambrian High Walk (both summer & winter) starts off by the side of the A44 by Pont Eisteddfa-Gurig and ascends steeply up the Southern slope of Pen Pumlumon Fawr (the highest mountain in the Cambrian Range at 752m) to the summit, and then down the Northern slope into Craig-y-Fedw. 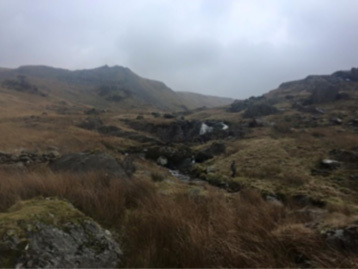 From Craig-y-Fedw the route continues North-West over part rough track and part wild mooreland terrain skirting the foothill of Carn Hyddgen, then Bryn over Moel, to the next challenging ascent up Foel Fras to reach the summit at 529m. 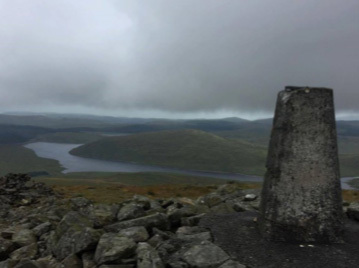 The Participants then turn around on the summit of Foel Fras and retrace their steps back over the same route. With an Ascent +1146m and -1148 this route has marginally more Elevation Gain than the usual Route over Pen-y-Fan which has an Ascent of +1142m and - 1127m, and it will push the participants to their limits and test their perceived boundaries beyond their wildest expectations. 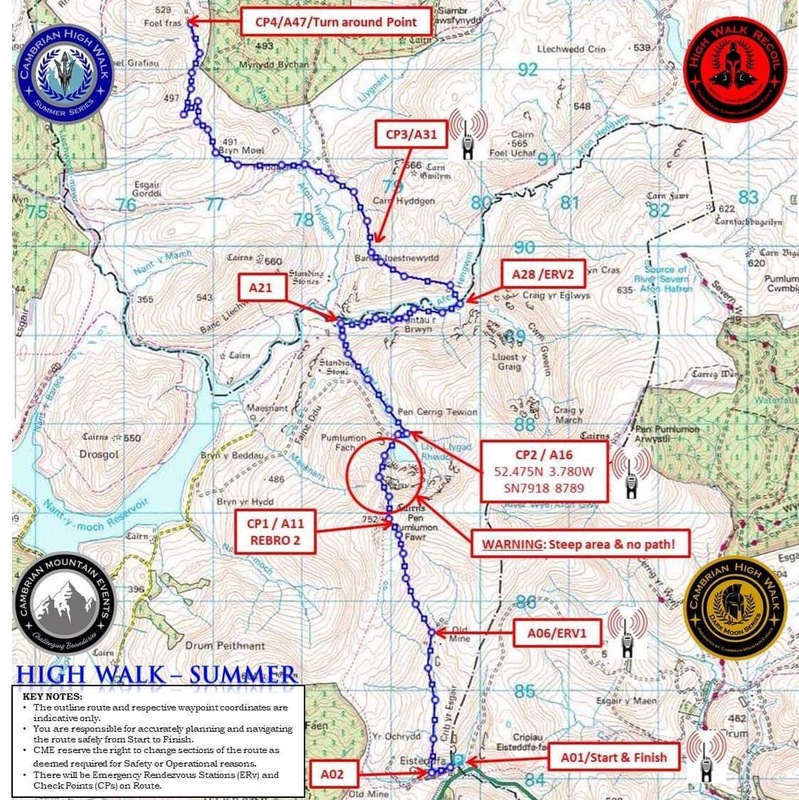 Please note, this event is held in the height of summer and is classified in a "Hi- Endurance" category, which requires the participants to possess a high level of fitness, have experience in similar Hi-Endurance events, possess good navigational skills and a high level of physical/metal resolve to undertake and successfully complete the event in such exposed wilderness terrain with the good possibility of all the elements of adverse mountain weather being against you. It is mandatory that all participants wear appropriate clothing to suit mountain terrain and weather conditions, carry the essential personal safety and navigational equipment with a full understanding of its respective use, carry/consume hi-calorie food and adequate water to sustain themselves during the event in both Entry Categories of the event. In respect to footwear, Participants in the load-bearing category must wear appropriate mountain boots with good ankle support; whilst Participants in the clean fatigue category may wear suitable fell-running or approach shoes. Trainers or any such unsuitable footwear will not be permitted. There will be no exceptions in these requisites, where participants who do not comply will not be permitted to partake in the event. Sorry, but this is primarily for your own personal safety, and also to alleviate the risk of you compromising the safety of others. The Event Pack containing the Entrants Brief will be provided 5 days prior to the Event. All participants who successfully complete the Event will receive the unique event patch and be treated to an after- event catered meal and refreshments at the Crown & Anchor Public House in Llanidloes. The online Registration System will be closed 7 days prior to the Event. The Event Pack to include Outline Route Maps, Indicative Route Waypoint Coordinates and Entrants Brief will be emailed to entrants 5 days prior to the Event. Entrants who successfully complete the Event will receive the unique Event Patch and be treated to catered meal and refreshments provided by the Crown & Anchor Public House in Llanidloes. Sorry, no Children below the age of 15 years due to Safety Reasons. All young-persons between the ages of 15-18 years must be registered and accompanied by their Parent or Guardian for Safety Reasons. Also, can all those who are interested in partaking, kindly visit our CME Facebook Page, like the page, and confirm their intent to partake on the Facebook Page Event section as well, as we are looking to build a Facebook Community following for the Event. All notifications and updates respective to the Event will be posted on this FACEBOOK PAGE. 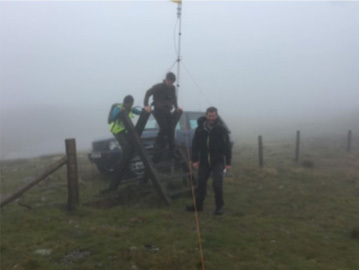 The event organising team reserve the right to change sections of the Route or Check Point Locations prior to the Event, due to terrain associated restrictions or any other factors that could compromise the safety and welfare of the participants and support staff alike.